BILISI, -- The Georgian parliament has postponed the adoption of a landmark bill that will drastically change local government, after the draft Self-Governance Code was harshly criticized by the influential head of the Georgian Church. The bill should have been reviewed on Friday, but the process was postponed until next week, when it will undergo some changes. Authorities are not specifying exactly what changes, but it will almost certainly concern how much leverage the central government will have over the regions. It was said that the establishing of regional councils consisting of elected members of local sakrebulos, will probably be abolished or replaced by a less independent and powerful body. 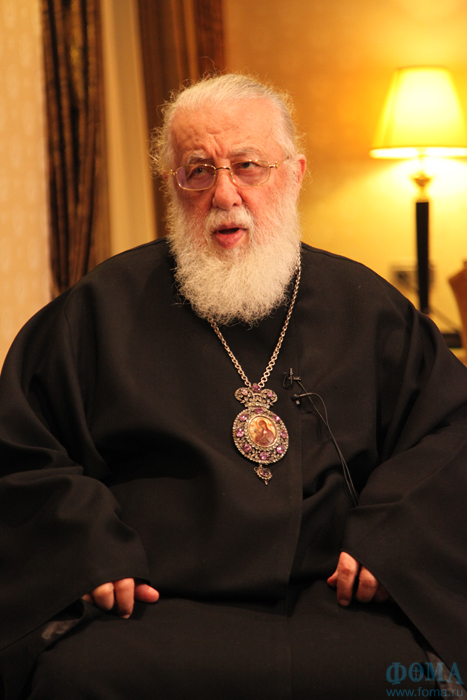 On Wednesday, the Georgian Patriarch Ilia II said that adopting the proposed bill would cause further desintegration of the state. “If this law is enforced we will end up with the total disintegration of Georgia. We will never accept this and will do everything against it,” Ilia said during his sermon at the Svetitskhoveli cathedral in Mtskheta. According to opinion polls, Ilia II is the most popular person in the country with 97 percent approval rating and his strong statement against the bill caused immediate confusion in the ruling Georgian Dream coalition. Then Prime Minister Irakli Gharibashvili and Speaker of Parliament David Usupashvili met with the patriarch but no official statement was released after the meeting. Meanwhile, many NGOs urge the authorities to keep on with the bill despite the Church’s objections. “We call upon the Georgian government and parliament, as the main guarantees of realization of the citizens’ constitutional rights, not to yield before the wave of discrediting of the principles of the self-governance and not to stop the reforms,” says a statement released on Thursday by 24 civil society organizations, among them Open Society Georgia, Transparency International Georgia, Human Rights Center and International Society of Fair Elections and Democracy. The new draft local government code was prepared by the Ministry of Regional Development and Infrastructure. The minister, Davit Narmania, is one of favourites of the former Prime Minister Bidzina Ivanishvili and nominated as the ruling coalition’s candidate for Tbilisi mayor in the forthcoming local elections scheduled for May, 2014. The draft bill grants more autonomy to local entities and is praised by many experts and civil activists active in the field, as well as the EU, with whom Georgia signed a landmark association and free trade agreement in Vilnius last week. The deal will come up for a final signing next year, after going through a ratification process in the EU system. At the same time, this move invokes bad memories for a nation that has been through three wars with two territorial entities, Abkhazia and South Ossetia, which broke away and a third, Ajara, was ruled by the authoritarian leader Aslan Abashidze and his family clan for more than a decade, until a showdown on the administrative border on the river Choloki in 2004, in the wake of the Rose Revolution, when supporters of former President Mikheil Saakashvili finally managed to peacefully oust Abashidze. Authors of the bill say there is no threat of similar conflicts being caused by the decentralization of power the bill will lead to, but conservative politicians and the church are n onethesame against any delegation of central power to local authorities. It is not discussed publicly, but conservative politicians concede in private interviews that direct elections of local authorities in the regions where there is a majority of non-Georgian population will stoke unrest. Georgians are in minority in Javakheti, which has a predominantly Armenian population, and some districts of Kvemo Kartli, there the Azeri are in majority. The 87 page draft bill defines the legal and financial basis of local government, and introduces direct election of city and town mayors in all population centers with more than 15,000 people, and gamgebeli in smaller places, along with establishing regional councils that share power whith the governor. The former consists of the representatives of elected local sakrebulos, while the later is appointed by the central government. The draft implies almost a doubling of the number of municipalities from 69 existing local entities to 120 in the future.